In 2013, voxel exploration game Cube World blew up, amassing millions of views on YouTube and video game sites. Despite the hype, Cube World’s creators became infamous for going radio silent, while the paid alpha for the game hasn’t updated since July 2013. Many fans have probably asked themselves, “What happened to Cube World?” And yet, some still hold on to hope. Every so often, Cube World developer Wolfram von Funck will tease an upcoming feature or tweak on social media: new music, improved questing, new terrain, what have you. The gaps between social media mentions can be excruciating, with fans sometimes waiting up to five months before hearing about minor things like new shaders or map functions. Funck has spoken to Kotaku multiple times now, always reminding us that Cube World has a very small development team who are working at their own pace. Just because Cube World doesn’t have a constant marketing drip feed doesn’t mean the creators have given up on it. It’s the opposite, actually: Cube World is their baby, so it’ll be ready when it’s damn ready. Some people, like Matt Armour, are still playing Cube World nearly every day. “For me the game is exactly what I enjoy about gaming—an open-world sandbox that is beautiful to explore and open to let your imagination do the work,” Armour said over email. Armour uploads Cube World adventures to his YouTube channel, where the game serves as a backdrop for vlogging. In some ways, Cube World’s barebones alpha is actually a boon, because the YouTuber can focus on speaking to his audience. Still, Armour does have to find ways to keep Cube World novel. For that, he often changes up his character’s loadouts, does some roleplaying, and makes sure to matchmake with friends. Keeping the game alive on YouTube also means Armour has to deal with the hate surrounding Cube World’s perpetual stasis, however. “Playing the game for so long, you hear it all in the comments ‘Wollay took the money and ran,’ and ‘Game’s dead’ but for me, and I believe for Wollay too, it’s still fun even in this state,” Armour said. 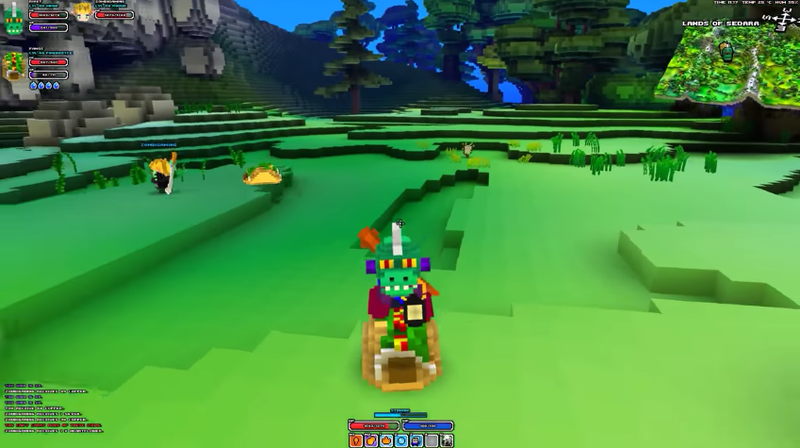 Armour often plays with Rivet Head, another YouTuber who still enjoys Cube World nearly every day. “Initially, I was drawn to the simple graphics and game-play, but shortly after getting into it, I found it to be one of the most complete gaming experiences I have had in years,” Rivet Head told Kotaku via email. According to Rivet Head, even though he plays the game religiously, he’s still discovering new stuff in 2017. “Recently I found out that if you initiate a dodge while falling from a great height, you can usually land without taking damage,” Rivet Head said. Like Armour, Rivet Head spends a lot of time with Cube World’s multiplayer, because it’s an easy way to keep things entertaining. Sometimes, though, he has to get creative. “A few months ago a friend of mine (DreamACH2) decided to create some skin mods for the game...I can honestly say that riding around in the game on a steak or a taco is one of the most surreal and fun things I have done in ages,” Rivet Head said. One fan I spoke to, Slash7530159, said they were planning on hitting level 500 within Cube World, eventually working their way up to some of the best weapons in the game. While I did see some remarkable displays of dedication, most players I spoke to explore Cube World’s blocky biomes every so often, dipping in and out of it whenever it happens to cross their mind. Rafael Encarnacion told me that he recently picked Cube World back up for the fifth time in a few years. Usually, he deletes his character and starts over again, wanting to “try and recreate the initial feeling of when I first played it,” he said. Even in an alpha state, Cube World sparked the imagination, in some ways acting like a digital Rorschach test for players who want to get lost in its procedurally generated worlds. Based on conversations I had with players, to love Cube World in 2017 is to embody a paradox of optimism and resignation. “Now the hype has faded and I still look forward to [a Cube World update] but I don’t think about it everyday,” Armour said.